Photo: Rafael Edwards. CC BY-NC 2.0 (cropped). In case you haven’t been able to keep up with all the details and implications of ever-spiralling global energy use, the financial risks are increasingly varied. Due to the no longer negligible number of headlines that cover carbon emissions these days, you may be aware that the International Energy Agency, the Carbon Tracker, the United Nations, other reputable research groups and investment banks too are worried about the status-quo burning of fossil fuels and the expected impact thereof. More and more studies agree: avoiding a very disruptive level of global warming (commonly estimated to be 2°C) would necessitate immediate large pollution reductions that would mean leaving much of the world’s fossil fuel reserves in the ground. The resulting financial concern is that regulation to curb emissions could create a “carbon bubble” by causing some fuel reserves to become stranded assets. That worry is now joined by other risks that investors are being urged to consider. One is the risk of “demand destruction” or “peak demand”. Experts caution that big technological advances, like leaps in the fuel efficiency of cars or solar cells, can impact how much gas or coal-fired energy people need to buy. Another factor in the risk of peak demand is one spurred by what could be deemed ethical advances. Divestment movements exerting public pressure have begun to see universities, churches, pension funds and banks selling off fossil fuel investment assets with a view to curbing greenhouse gas emissions and the environmental and social impacts of resource development. “Even when divestment outflows are small or short term and do not directly effect future cash flows, if they trigger a change in market norms that closes off channels of previously available money, then a downward pressure on the stock price of a targeted firm is possible,” says one report from stranded assets researchers at Oxford University’s Smith School. “As with individuals, a stigma can produce negative consequences for an organisation. For example, firms heavily criticised in the media suffer from a bad image that scares away suppliers, subcontractors, potential employees, and customers. Governments and politicians prefer to engage with ‘clean’ firms to prevent adverse spill-overs that could taint their reputation or jeopardise their re-election. Shareholders can demand changes in management or the composition of the board of directors of stigmatised companies. Stigmatised firms may be barred from competing for public tenders, acquiring licenses or property rights for business expansion, or be weakened in negotiations with suppliers. Negative consequences of stigma also include cancellation of multibillion-dollar contracts or mergers/acquisitions. Stigma attached to merely one small area of a large company may threaten sales across the board,” the report explains. Meanwhile, seemingly to squeeze out every possible chance of profit before any possible bubbles inflate too fully, development of fossil fuel sources continues apace. And, speaking of stigma, in many regions of the world, these development plans are attracting more and more public scrutiny and sparking resistance, particularly with regard to indigenous rights. Connected via internet and social media, knowledge spreads quickly and global ‘netizens’ are eager to call for justice on behalf of those across the globe. “Indigenous peoples shall not be forcibly removed from their lands or territories. No relocation shall take place without the free, prior and informed consent of the indigenous peoples concerned and after agreement on just and fair compensation and, where possible, with the option of return,” states Article 10 of UNDRIP. In developed nations, those affected have more of a voice and often some influential allies anxious to help in stigmatizing a company. In Canada earlier this month, iconic musician Neil Young spoke out about oil sands development and its impacts on the environment and on First Nations (as indigenous peoples are called in Canada) and got into a public statement spat with the Prime Minister’s Office. Photo: Larissa Sayer. CC BY-NC 2.0. And in some countries, legal remedies are a possibility. Here in the Canadian province of British Columbia (BC), a tenth court challenge was filed last week to a federal review panel’s recommendation that the government approve the Northern Gateway pipeline, a multi-billion dollar Enbridge proposal. The very contentious 1,200-kilometre pipeline would extend from the Edmonton area in the middle of the neighbouring province of Alberta to a tanker port in Kitimat, BC. This latest challenge was brought by the Gitga’at First Nation, a small community on BC’s north coast that is accessible only by air and water. The Gitga’at say that tanker ships transporting bitumen (the extremely viscous form of petroleum mined from Alberta’s oil sands) through the Douglas Channel that runs right by their isolated village would pose a grave threat to their way of life. But that project isn’t the only one facing challenges in Canada. The Athabasca Chipewyan First Nation filed a lawsuit earlier this month against Shell’s Jackpine oil sands expansion in northern Alberta. They say the approval process for the expansion broke at least three federal statutes — the Canadian Environmental Assessment Act, the Species At Risk Act and the Migratory Birds Convention Act, as well as several international agreements Canada has signed. They further argue that the approval process broke the First Nation’s constitutional right to be consulted. Apparently, these examples are just a few among many in Canada. In 2012, a former corporate lawyer turned strategist in the area of native, government and corporate relations authored Resource Rulers: Fortune and Folly on Canada’s Road to Resources, a book about the power of treaty rights in modern-day Canada. Author Bill Gallagher has to date documented 190 legal wins for First Nations. “I believe we are about to witness the apex of the rise in native empowerment in the Canadian resources sector,” Gallagher said in reference to oil sands that are also on treaty land. This pioneering report was put together by First Peoples Worldwide, an indigenous-led organization that funds culturally appropriate local development projects in indigenous communities all over the world, as well as acting as a convener between indigenous communities and corporations, governments, academics, NGOs and investors in their regions. 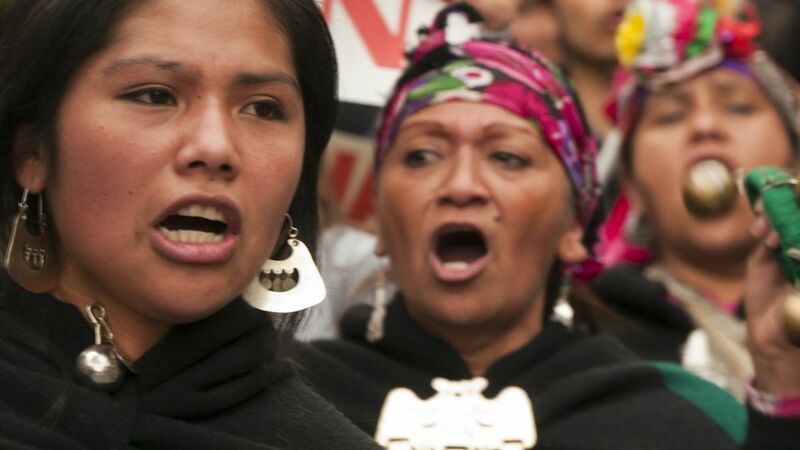 “Events over the last decade have proven that companies that fail to respect indigenous peoples’ rights and do not forge positive, trust-based relationships with Indigenous communities increase their risk of protests, negative press, work stoppages, shut-downs, and law suits — all of which have a negative and material impact on profits and share price,” according to the Indigenous Rights Risk Report. The aggregate risk corporations face when operating on or near indigenous peoples land is not isolated to one company, one sector or one geography, the report notes. The research team assessed (and scored) the risk to which companies expose investors and shareholders based on where and how they are managing their operations and whether or not they are productively working with indigenous peoples. The team analyzed 370 oil, gas and mining sites on or near indigenous land that are operated by 52 US-based companies. Describing the results as “alarming”, the report found 92 percent of the oil, gas and mining sites analyzed posed a medium to high risk to shareholders. Nearly all of the companies in the study face a medium to high risk profile for at least one of their sites. Yet 90 percent have no policies to guide them on how to positively engage and work with indigenous peoples. Among those receiving the highest overall risk scores are Chevron’s and ExxonMobil’s Niger Delta sites in Nigeria (see related stories at the bottom of this page) that have made worldwide headlines for years now and several companies’ projects in Argentina due to widespread Mapuche opposition. Subsequent research by First Peoples Worldwide will track changes in a site’s risk score and the factors that caused the change. The demand for the right to give FPIC for any activities undertaken in indigenous territories is key to the indigenous rights movement, First Peoples maintains. FPIC allows indigenous communities to decide what happens on their land and thus retain control of their assets, including their natural resources and traditional ways of life — i.e., their current and future prosperity. And in protection of their own future prosperity, it will pay off for companies to begin learning from organizations like First Peoples. Now that the easiest to extract petroleum reserves are waning, the industry is turning to “unconventional” sources that cost more to explore and develop such as oil shales, oil sands-based synthetic crudes and offshore deposits. This means developers aren’t guaranteed the same bucket loads of cash, as evidenced by recent profit warnings issued by Shell and Chevron as they failed to meet forecasted earnings. Gallagher calls the issue of indigenous entitlement “the biggest under-reported business story in Canada of the last decade”. He believes that the threat of indigenous legal action could derail a host of proposed projects in BC. Among them are the Enbridge and Kinder Morgan pipelines, the New Prosperity Mine, the Jumbo Glacier Ski Resort, the Site C Dam, and the Mount Klappen open-pit coal mine. Meanwhile, companies and investors may want to subscribe to First Peoples Worldwide’s year-old monthly Corporate Monitor newsletter on key trends affecting companies interacting with Indigenous Peoples. “Throughout 2013 we’ve reported the good, the bad, and the ugly,” Corporate Monitor staff noted last month. “We’ve seen companies building cooperative relationships with local communities, learning how to respect free, prior, and informed consent (FPIC), and honoring indigenous treaties. “We’ve also seen companies ignoring or misunderstanding FPIC, directly or indirectly inciting violence in communities, and disregarding treaties and harming environment. Energy Investing: The Indigenous Rights Bubble by Carol Smith is licensed under a Creative Commons Attribution-NonCommercial-ShareAlike 4.0 International License.